In Windows 8 Release Preview doing a forced restart while running Visual Studio can course some file errors. Conviently Visual Studio ask if it should try to recover the files. When opening the project the following is displayed. Microsoft Visual Studio Express 2012 RC for Windows 8 encountered a problem and was shut down. We are sorry for the inconvenience. 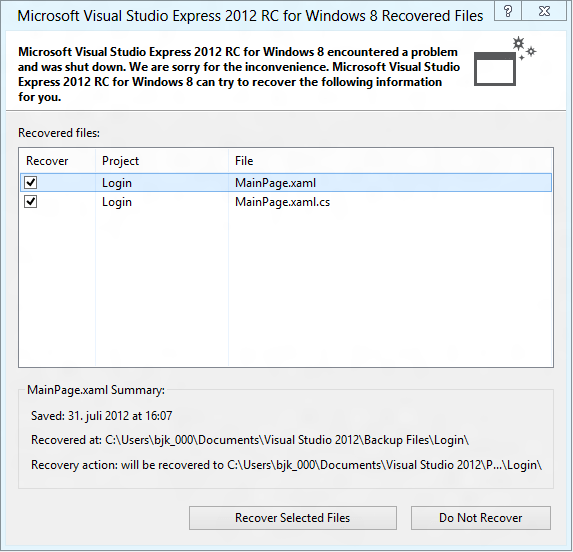 Microsoft Visual Studio Express 2012 RC for Windows 8 can try to recover the following information for you. After Recover Selected Files the files has been fixed the project is still runnable. Kudos!